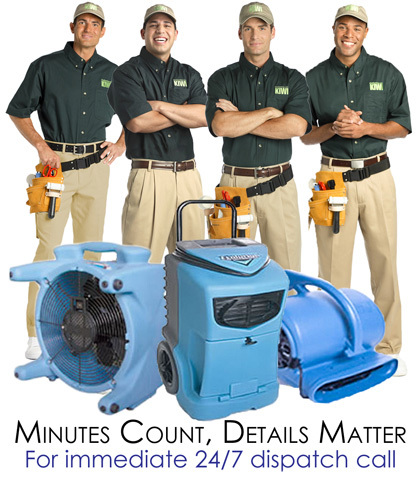 The need for commercial water damage restoration can strike your business at anytime, which is why KIWI offers you and your business 24/7 emergency water damage repair services. We know that water damage repairs must be timely and well-done, and for 30 years we have restored businesses back to their original state. When choosing KIWI for your water damage restoration needs, you choose quality and experience. KIWI’s commercial water damage repair team is IICRC certified, licensed, and bonded, giving you a trusted source for repairs. KIWI wants to make sure that you have ample coverage for all work done, which is why we work with your insurance to help cover costs. KIWI treats all affected areas with an antimicrobial to prevent your business from dealing with mold, mildew, and bacteria. KIWI can also provide commercial air duct cleaning to help your business’s air quality. KIWI covers all business types. From hospitals to grocery stores, KIWI has you covered. We know that your place of business must be in perfect order to better assist your clients, which is why KIWI works hard with the industry’s best equipment to make sure your business is well-serviced. If you are experiencing water damage in your business, give KIWI’s Dallas commercial water damage services a call today. We will get your business back to normal in no time.